No quarterback ever had a cooler name: Willie Thrower. When you hear it, visions of picturesque deep balls, efficient two-minute drills and fourth-quarter comebacks immediately come to mind. Much more important than his great name, though, is what Thrower accomplished during his brief time in the NFL. Because in only two career games, Thrower cleared one of the biggest hurdles in professional sports, paving the way for African-Americans to eventually thrive at football’s most important position. In 1953, Thrower became one of the first black men to play quarterback in the NFL’s modern era. 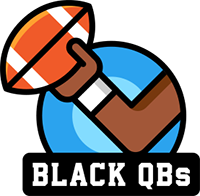 The league’s unofficial ban on black players was lifted in 1946, but teams still blocked African-Americans from playing quarterback. Blacks excelled at running back, and many top-notch black players entered the NFL in the 1950s and ’60s. But the highest-profile job was off-limits to blacks, largely because of the racist belief that blacks lacked the smarts and heart to lead white men. Although George Taliaferro played quarterback among his seven positions in the NFL from 1951-55, Thrower was the first African-American to exclusively play quarterback in the league. On Oct. 18, 1953, Thrower became a trailblazer. During a 35-28 loss to the San Francisco 49ers, Thrower, then a Chicago Bears rookie, replaced starting quarterback and future Hall of Famer George Blanda. Thrower completed 3 of 8 passes for 27 yards. Of course, his performance that day is almost irrelevant. The fact that Thrower got in the game was the story — and what should be remembered most about his football days. The importance of Thrower in the evolution of black quarterbacks must not be underestimated, Harry Edwards said. Edwards, who since the 1960s has been at the forefront of the discussion about race, sports and politics, has studied Thrower’s career in college at Michigan State and in the NFL. Thrower did a whole lot. “He was among that first post-World War II cohort of black athletes to step across the color line in professional football,” said Edwards, professor emeritus of sociology at the University of California, Berkeley. “Thrower was a pioneer playing the leadership, authority and intellectual position of quarterback, which, with the exception of him, was reserved at the time for white players. But he didn’t have many games in which to display his skills. Because of his race, many major college football programs declined to recruit Thrower in the late 1940s. Not only did Michigan State pursue Thrower, but the coaching staff also switched him to quarterback to capitalize on his strong arm and athleticism. Thrower backed up All-American Tom Yewcic on the school’s 1952 national championship team. Back in those days, the NFL didn’t draft African-Americans to play quarterback. During one more game in the ’53 season, Thrower played briefly. The Bears released him before the start of the next season. He had a good run in Canada, playing four more seasons. After a separated shoulder ended his football career, Thrower became a social worker in New York and eventually returned to New Kensington and operated two taverns. Thrower deserves more recognition from the NFL. Moon and Doug Williams are among the NFL’s pioneering black quarterbacks who haven’t forgotten Thrower. Just like Thrower, Williams burst through a major barrier: He was the first African-American signal-caller to win a Super Bowl. Partly because of men like Thrower, Williams reached the game’s highest heights. “When you talk about pioneers, I came into the league in 1978. Willie Thrower set the pioneer bar in ’53. He was a quarter-century ahead of me,” said Williams, in his first season as the Washington Redskins’ senior vice president of player personnel.